This was the first conversation my husband and I had on the morning of our 17th wedding anniversary day. My husband’s absolute favorite food is the Stromboli, and guess what? With 17 years of marriage, I have never made his favorite food. Never…! I have been making every food on the planet, everything EXCEPT Stromboli. All these years I have been busy perfecting my Kimchi recipes or searching and trying out far-far-away exotic foods, but making Stromboli (which is NOT my favorite) didn’t quite fell into my ever *must try* recipe list. Stromboli is not difficult to make at all. If you know how to make the *pig in a blanket*, which basically is a hotdog wrapped in a bread dough, you can easily make this without much fuss. The only problem I encountered was that it was hard to find the various cured Italian pork in the middle of tropical land where pork product is considered “non-Halal”. Typical meat choices are salami, ham and pepperoni. Some likes to add sausage, sauteed peppers and onions on top but I like to stick with “meat & cheese only” request from my protein loving husband. I had to make fresh pizza dough for my Stromboli, but a store bought frozen pizza dough would be a great choice as well. Take a look how easily I put them all together even with a braided look on the outside. Fancy-schmancy! 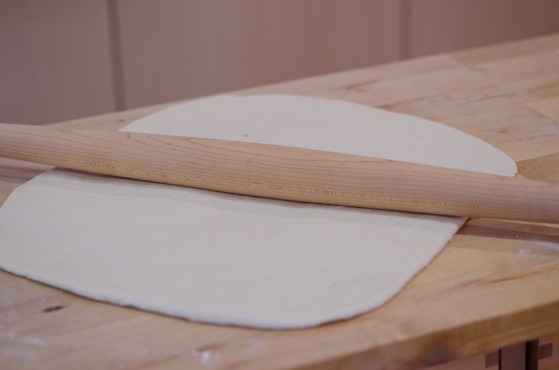 First, roll out your pizza dough about 11″x13″ or so. No need to be exact. 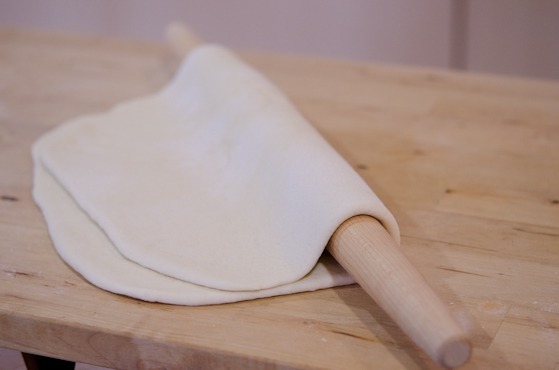 Using your rolling pin, transfer the dough on to a baking pan. 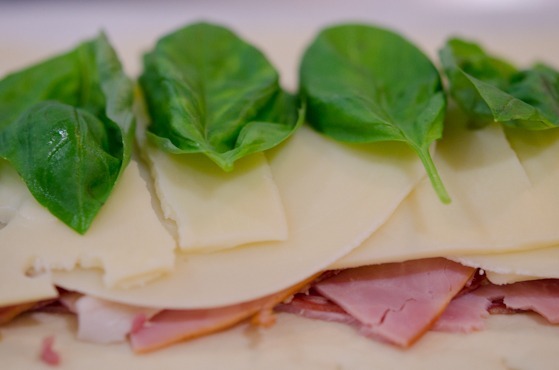 Layer cheese (provolone and mozzarella) on top and place a few basil leaves. It is my duty to feed my family “vegetable”. I added some Swiss cheese since I had a few slices on hand. 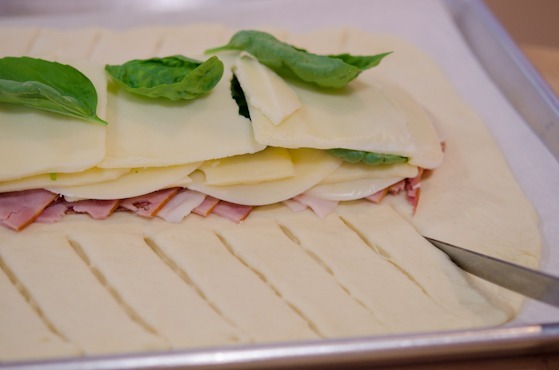 Cut each side of pizza dough to make 1″ strips with a knife or a pair of scissor. Fold the top end first, then bring the strips from each side to make criss-cross pattern one strip at a time. When it comes to the other end, fold the end and finish the final 1-2 last strips to secure. Kind of like that… I found braiding is so amusing that I want to braid everything from now on. 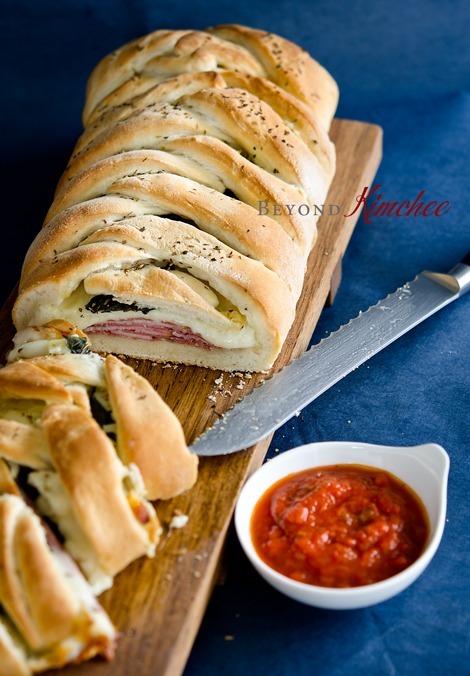 DO NOT forget to serve the Stromboli with warm marinara sauce to dip in. My poor husband who’s been putting up with me for 17 years (and willing to do whole lot longer through eternity) really enjoyed this Stromboli for lunch. We had a nice dinner at Mandarin Oriental Hotel that night to celebrate our marriage. 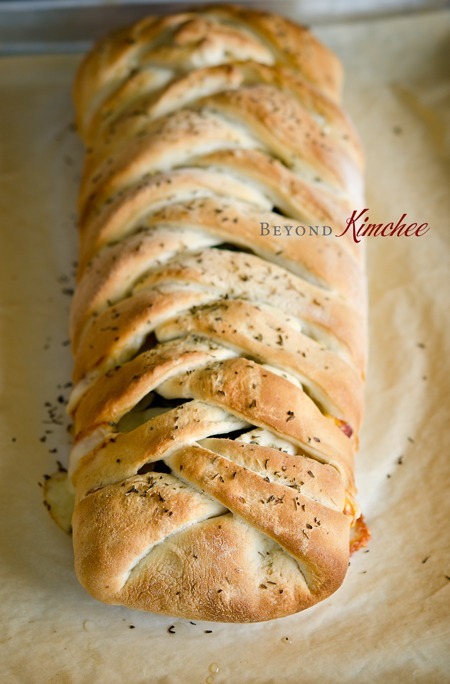 As I was staring at the braiding work on my Stromboli, a thought came to my mind. What a profound wisdom coming out from just looking at a piece of Stromboli? See…? Food is not just food. It can give you valuable life lessons. Don’t you agree? Roll out a pizza dough to form a thin rectangular crust, about 11"x13", and place the crust on a baking pan lined with a parchment paper. 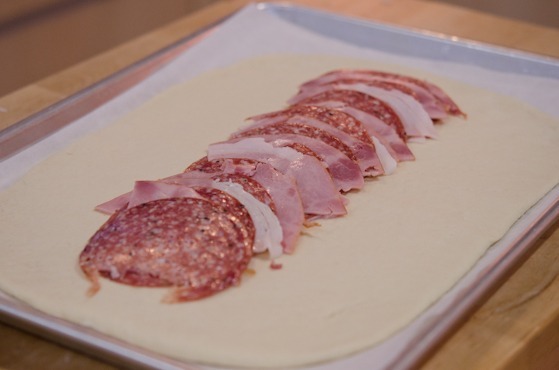 Layer slices of ham, salami, and pepperoni as a single row in the center of crust. Layer cheeses over meats and place basil leaves on top. Using a knife or a pair of scissor, cut either sides of crust next to the meat & cheese filling to make several 1" wide strips. 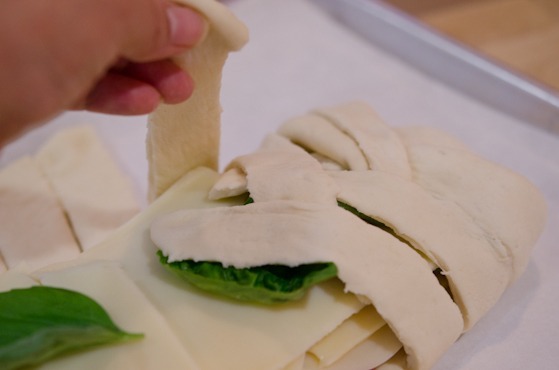 Fold-in the each end part of the crust toward the filling. Using one strip at a time criss-cross each strip to cover the filling. Drizzle olive oil over the crust and sprinkle oregano. Bake for 15 minutes or until the crust turns golden brown. Serve hot with warm marinara sauce to dip in. I have made Stromboli and have use pizza dough from my favorite pizza place and grocery store and I find it easier to make my own dough. I love your braiding and how golden brown the crust is. I usually cut the dough in three pieces and let everyone make their own. My daughter likes chicken, cheese and spinach! The worst part is rolling so now I am so excited to try the braid. Braiding is quite simple and anyone can do it. It looks quite nice on the table, too. 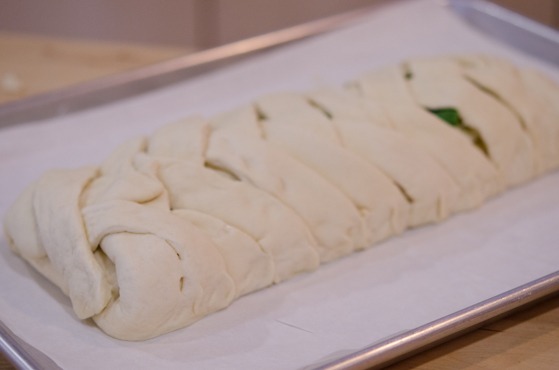 Everyone making their own Stromboli with favorite filling is a great idea. Thanks, Lindsey. I've never made it as well, but I will because I love baked goods and I like everything you put inside. Sicilian pizza crust will be so awesome especially with their flavorful sausages.
" Food is not just food. It can give you valuable life lessons." Totally agree with this. I've never made stromboli either - never even thought to do so! It's always been something I'd buy. Yours looks terrific - maybe I should give this a try sometime. Fun post - thanks. Oh, and congrats on 17 years! Hi, there! Thanks for this! It does look super-easy, and I'll be trying it soon. Do you have a tried-and-true dough recipe you like and would share? Yes, I do. I will share the recipe someday. This is wonderful. I will definitely try it for my next picnic. Can you please share your dough recipe? Nami, you are so sweet. Thanks for the compliment. 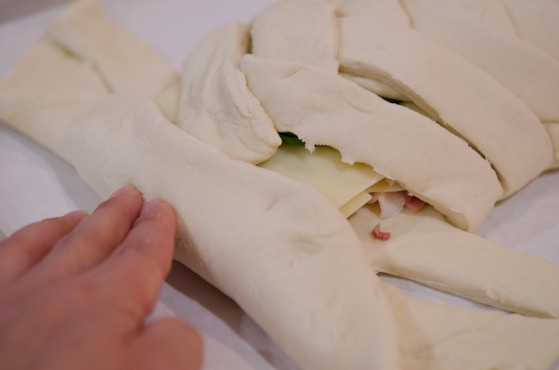 You are right, you can use all the leftover cold cut to make the Stromboli and it is very easy to make. Happy anniversary! I love Strombli and can't imagine a better way to celebrate... though the Mandarin Oriental sounds very lovely, too. I am v. impressed by your braiding technique! This looks amazing. I'd also love it if you could share your dough recipe! Holly, i love your dry humour! 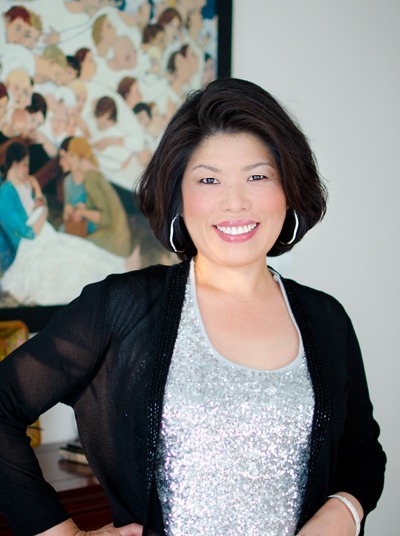 So yes, i really enjoy reading your post, in addition to the great recipes of course:). Its so funny, i actually has a draft post about how this year is my 10th wedding anniversary and i had never made my husband's favourite family dish until two weeks ago!! ROTFL. I made this for dinner tonight. So easy! It's cooling off now, can't wait to dig in. So I made it, and it was wonderful! It looked great and tasted even better. Thanks for the easy recipe! So happy to hear that you enjoyed the Stromboli. Thank you for leaving me the sweet comment. This looks so beautiful! Well done, and happy anniversary! I am making this for dinner tonight. You make it look so simple and beautiful. I had to try it! Made the Stromboli yesterday and it was absolutely delicious. Looking forward to trying some more recipes. Great! Hope you get to try more recipes. 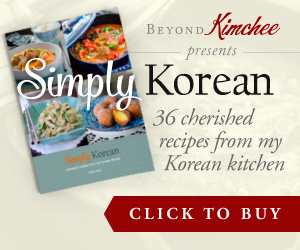 Please, let me know if you have any questions regarding the recipes. Thank you for the comment! I have a couple questions; how thick would you say the dough is when you roll it out? You said thin, but what does that equate to? Secondly, a girlfriend gave me a recipe that includes an egg yolk for the filling. However, I have looked at several recipes online and none uses an egg. What is your opinion on egg yolk in the filling? Thanks for taking the time to post the wonderful recipe. Hi Sarah I would say the thickness is a little thinner than 1/4 inch. I personally never tried using egg yolk in the filling but I know some do. They mix egg yolks with herbs and Parmesan cheese to spread on the bottom than layer with meat and cheese. I am not sure how much egg yolk will add flavor to the Stromboli but it helps the herb mixture to be spreadable consistency. Going to a football party. Trying to decide if I could make these and take them or if I should just make them up without baking and cook themehenI get there. Any suggestions? Stromboli tastes best when it is warm. You can make it up to the braiding step, keep in the fridge so that they don't rise too much, then take it to party and bake it there. (it has yeast in the pizza dough and it will rise. you don't want it rise like bread). However the whole process, rolling out, adding filling, and braiding, comes together very fast so if there is time and space in the party place, I recommend to put it together there. Hi Andrea It is great to hear you liked my Stromboli recipe. I think Stromboli is originated in U.S. I am not sure how it got the name but surely sounds like Italian, doesn't it? Looks absolutely delicious. I'm gonna hit the store after work to see what meats are on sale right now, but the braiding looks fun! I might have to try that! Thank you very much Pat. Your comment is so sweet. Chicken and broccoli sounds very nice especially with the cheddar cheese. I think the possibilities are unlimited with the basic recipe like this. Making my second one today. I gave up trying to braid on my first attempt. This one I braided. As a single dad I don't cook much but this was great. I used Canadian bacon, pepperoni and cooked ham. Thanks for posting it was awesome! Cooking it up in Texas! It takes less than ten minutes of work to make pizza dough from scratch. So much better than store bought, with all the preservatives. Hi, yesh plsss share with us your pizza dough recipe!!!! Thanks a million! Can I prepare this early, put in the fridge, and cook when it is almost time to eat? Also, do you let the dough rise before preparing it? I think you can keep in the fridge after you assemble it. No need to let it rise again. Eureka I have found it! 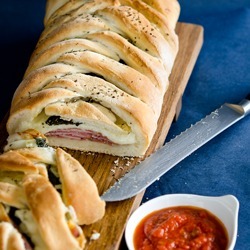 This Stromboli is what I am making for my husbands birthday dinner today. Thank you for your easy to follow instructions with great pictures. I love the humor and wisdom infused anecdotes. Thanks Samantha. Hope your husband loved it. Any idea on what to add using pulled pork? Cheeses, and seasonings? I'm only good add following directions horrible at knowing what goes with what. This looks so good, we are making it for dinner tonight. I am thinking that if we love it, I will give us all our own section next time so the kids can pick out their toppings, they would have fun with that. Hope your family liked it. 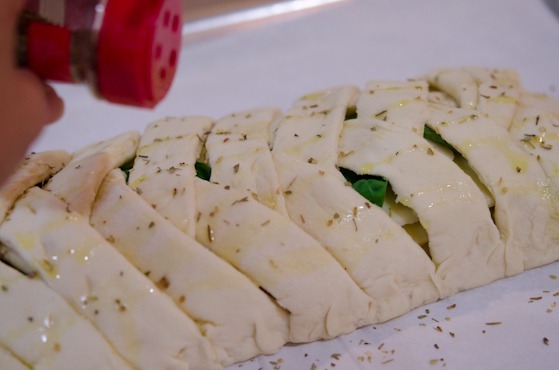 It is a great idea to have each one to build their own Stromboli. I've been searching SO many sites for stromboli since I have a problem. I use bread dough, which must be the same as pizza dough (do a lot of bread baking). I follow all he basic steps for rolling out the dough, etc. But cannot avoid air which lifts the dough from the filling. I see this in many photos but would really like to avoid that happening. Do you have any suggestions? a) this looks really yummy. b) I'm pretty sure that if the sauce is outside is a calzone and if the sauce is inside is a stromboli. The shape doesn't dictate the name. c) I doubt know everything, so I could be wrong. Made this today for a picnic, I cheated and used Pillsbury pizza dough since I was in a hurry. I'll make real dough someday. It didn't matter, it was gone quickly! This was wonderful, and it was so easy to make! The braid has a great presentation, and I think this is going to be one of my go-to party/potluck recipes. Delicious! Thank you! Great to hear it turned out well. Thanks! Thanks for the great idea, made as instructed and it was perfect (and pretty)!